17 year old Jayden Gray steps up to the 1st team squad tonight following an impressive season for the U18’s. An athletic midfielder with energy to burn, Jayden is a strong tackler that can pass at distance and play at speed. Jayden enjoys running forwards with purpose and is deadly from 25 yards in open play or from dead ball situations. 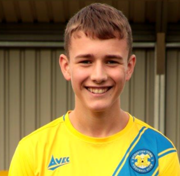 Jayden will also be joining our Academy next season, in conjunction with Stockton 6th Form College, another player to progress and given an opportunity.